This is the week 1 of a weekly art journal based on guides provided by Dale Anne Potter. The cover was constructed by laminating card stock to two sides of light cardboard. All pages are based on a tag created from card stock. For texture I created some paper snowflakes, glued them to the card stock and emphasized the edges with ink. 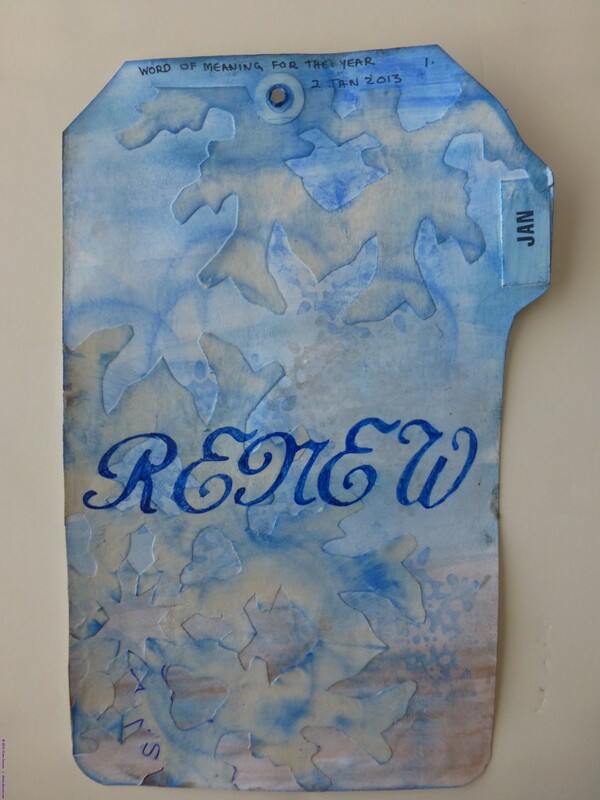 The word Renew is stenciled with a marker pen. The prompt this week was ‘My word of meaning for the year’. My word for 2013 is Renew. After interrupting the momentum of my art career to pursue almost four years of travel in our motor home – and I don’t regret a minute of it! – I find myself needing to reinvent myself in a new community far from my original location. I need to find new friends to support me, new venues to show my work and to establish new routines and modes of working in a totally new type of living accommodation. I’ve gone from a large, multi-room studio in the basement of our home to the second bedroom in a condo! And for ‘journalling’ on the back of the card – I listed the synonyms – and a couple of antonyms as reminders – of the word Renew. It forced me to think about the year ahead and how to proceed.